Kim Jong Un may or may not have watched news coverage of the strike on Syria by the US, Britain and France. If he did, he and the North Korean elite saw four things that should make them want to talk even more. Same goes for the mullahs of Iran. First, precision strikes have reached a new level. In addition to the TLAMS, the Pentagon said nineteen regular Joint Air to Surface Stand-off Missiles hit the Barzeh chemical weapons research facility. These new cruise missiles carried by the US Air Force’s B-1 bomber combined precision with heavy blast effects all while launching from 230 miles away or more. The Air Force has also developed JASSM-ER with more than double the range. Test video shows the winged weapon hitting buildings, penetrating underground bunkers and detonating at a cave mouth. Beyond this, the US and allies can do things to a target set that dictators can’t even imagine. Electronic warfare, deception and information operations have been around a long time – centuries, in some form. But cyber and other methods of exploiting the electromagnetic spectrum have blossomed over the past decade. Second, Russian-built integrated air defenses are not an impermeable shield. Especially if their radar tracking is not fully turned on. The Syrian air defense is postured against Israel and an attack from the west. Obama administration officials cited the air defense as a key reason for not striking back after Assad used chemical weapons in 2013. On April 14, 2018, Syria’s air defenses shot missiles in unguided mode. The first video clip from the attack showed a glowing missile arching over Damascus. Most likely, the little fireball was a Syrian air defense missile aiming at empty sky. The Syrians chose not to turn on the full capability and fire control tracking of their air defenses. They knew the Coalition has anti-radiation missiles that can target active SAM batteries. This is the third time that air defense operators have hunkered down during airstrikes. SAM operators in Iraq in 2003 and Serbia in 1999 were notorious for switching their fire control radars to OFF or activating them only briefly. Indeed, the Iraqis fired over 2500 unguided SAMS and the Serbians over 700 in those conflicts. Russia was quick to assert they had not activated the air defenses at their own bases in Syria. They deploy top of the line S400 surface-to-air missile (SAM) at Khmeimim air base, and Maysaf missile base, while the still-formidable S-300 guards Tarsus Naval base, according to Justin Bronk at Britain’s Royal United Services Institute. The “very presence of advanced Russian surface-to-air missile defenses such as the S-300V4 and the S-400” made Syrian airspace dangerous as Dave Majumdar pointed out in The National Interest. One wonders if Russia detected the attack. Their early warning radars and ships hiding out in the Mediterranean might have picked up indications of the inbound British Tornado/Eurofighter package or the French Rafale/Mirage strike. If so, it looks like Russia did not hand off that track to Syrian air defenses. Third, the US and its battle-tested allies work together better than ever. The anti-ISIS Coalition centered around airpower has years of experience with strike planning and operations. It took only days to pull together the allied strike on Syria. North Korea, Iran and other would-be proliferators should keep that in mind. Contrast that with the years of dithering in the 1990s over Serbian atrocities in the former Yugoslavia. That’s over, with a desire for world stability and countering Russia that transcends domestic politics. 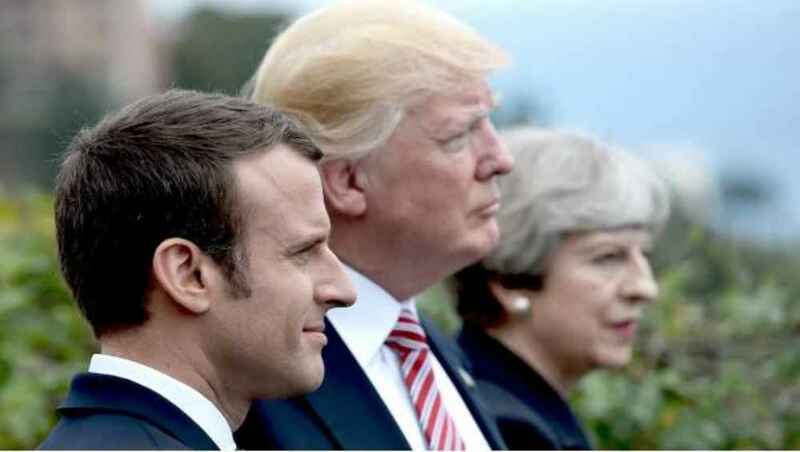 Striking back against ISIS especially after the attacks in Britain and France has oiled the mechanisms of cooperation. The swift action on Syria opened a new chapter in international security leadership by the US, Britain and France. Fourth, superb intelligence, surveillance and reconnaissance work supported the strikes. Launching over 100 missiles demands a lot of aimpoints. Coalition targeting knew details about the structure of each building. Intelligence is never perfect, but the level of detail achieved in the Syria strike should worry North Korea and Iran. Beyond this, the Coalition’s military leadership knew the Syrian airspace very well after years of operations. It must be said that F-22 fighters – their participation now confirmed – gave the Coalition a unique picture of the good, the bad and the ugly in the airspace that night. A small band of F-22s has been watching over other military aircraft in Syria since 2014. Their sensors deliver a confidence edge that surely made this strike smoother for everyone from pilots to political leadership.